The Design Weather Station BAR220 has a modern design and shows the current weather situation via coloured icons. There is no difference whether you are planning your outdoor activities or just want to know what the weather will be tomorrow in the morning when you have to get to work without switching on the TV or browsing the internet. Do you want to get information about the weather for the next 12 hours quickly and easily? 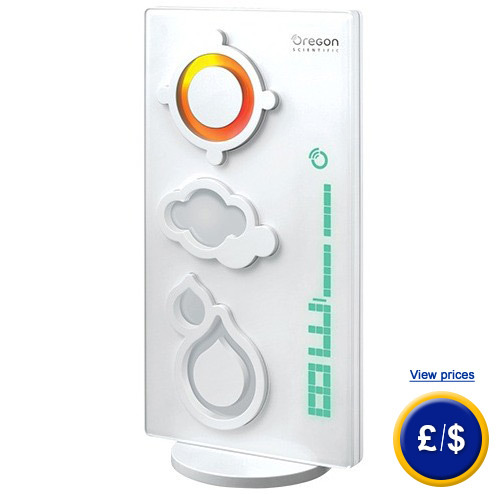 Then take a look on your beautiful weather station and you will receive all the information. Moreover, this weather station shows you indoor and outdoor temperature as well as the current time. This design weather station combines functionality with a modern look and quality, minimalism and beauty. This slim white device is very plain without any buttons and simply decorated. The icons and the clock are lighted and are placed on the front of the design weather station. If you are looking for a beautiful, minimalistic clock and weather station, this design weather station would be ideal for you. At the same time, it is a wonderful present for a family and friends. If you have any questions about this product, please contact us: UK customers +44(0) 23 809 870 30 / US customers +1-410-387-7703. An overview of all weather stations can be found here: weather stations Our technicians and engineers will be happy to help you with this design weather station and all other products in the field of measuring instruments, regulation and control and scales. - Display of inside and outside temperature is very useful.With that you can adjust to every weather situation, particularly, if a seasonal fluctuation of daytime and night-time temperature occurs. are in a different time zone.